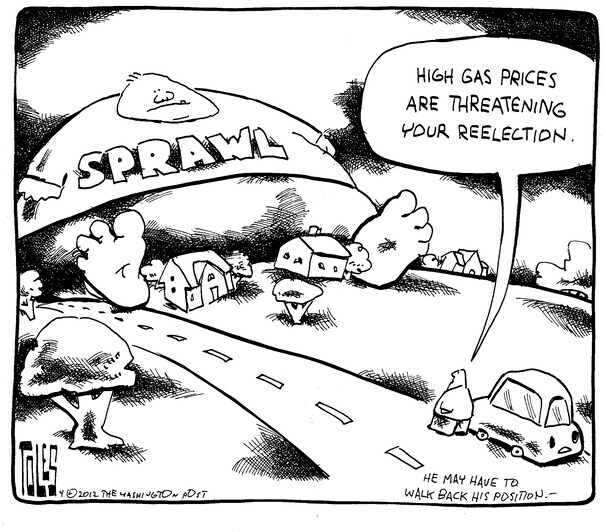 I am working on a piece about the decline of sprawl and return to the city nationwide, but I stumbled upon this cartoon in the Washington Post that I thought was very timely and topical given the content of this site. Enjoy. Who are you? Do you live in Stockton? Stockton organization, Campaign for Common Ground, has worked for smart growth and city boundaries for 9 years. You are talking right down our alley. Hi Rosemary, I am a native of Stockton, though I currently live in Washington, DC for work. I am happy that you enjoy my writing, I hope this site can get more people engaged in growth policies in Stockton as a way to help improve our city. Marvelous! I will help get the word out to the Campaign for Common Ground mailing list. If you come home for a visit, let us know. We meet first Monday of each month. We’d love to have you speak to our group. Rosemary, I would be happy to speak to your group, though I am not sure if I will be in town on any first Monday in the near future. I will contact you, however, if that changes. Thanks for your support. Why are Stockton's parking lots so big and empty?